How to Invest on a Low Income: Turn Small Cash Into Big Bucks! Many believe you can’t invest on a low income. I used to be one of those people. I wasn’t making a ton of money and thought it was impossible to invest on a small budget. For years that myth held me back. I speak to people everyday who believe the same thing and the simple fact is that it’s a lie. Investing in the stock market isn’t like buying a house or a car where you need a big down payment to be successful. You can invest in the stock market with little money and do quite well. I know we’re dealing with trying times, from stagnant wage growth to sky-high student loan debt but that really doesn’t matter. In fact, there are more options than ever today to invest on a small salary. You just need to know where to look and take action. Here’s how to invest on a small income and turn your money into big bucks! Many allow the amount of money they have to invest to hold them back. That thinking makes sense, on one level. We believe that $25 or $50 per month will do very little and think it’s better to wait until we have $250 per month to invest. That is a myth. Compound interest makes even $25 per month significant in the beginning because it’s the time that matters when you talk about investing. Einstein called compound interest the 8th wonder of the world because it’s so powerful, but the key is you need to save and invest to take advantage of it. I’ve shared this study before, but if you start investing at 25, you need to save three times less than someone who waits until 45 for retirement planning. 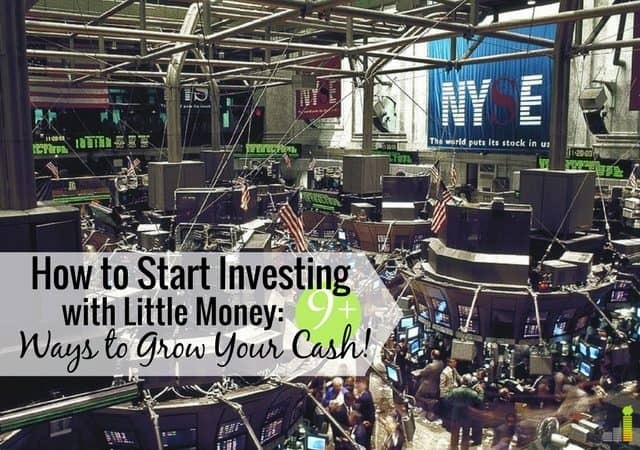 You need to save and invest less actual money if you start early and in small amounts. Of course, you’ll need to increase the amount you save from the $25 per month example, but you will already have the discipline in place, so it won’t be a problem. Study after study points out one major reason why many are not investing in the stock market – lack of money. Given the numbers of student loan debt and consumer related debt, it’s not surprising. That doesn’t even begin to touch on the issue of being in a low paying job. Regardless of the situation, it can be difficult to come up with extra money to invest. Again, you can invest on a low income if you’re purposeful about your finances. First, take an honest look at your debt. You absolutely want to kill any high-interest debt. If you have student loans, or a mortgage than are lower, say five percent, continue paying on those but throw extra money at your debt. If you need ideas on how to pay off debt quicker, here’s a list of 25 ways to start paying off debt. Second, analyze your expenses. Is there anything in your budget you can live without? Take a serious look at your spending to see what you can get rid of to free up cash. Here’s a list of 35+ ways to save money every month that will give you ideas to free up cash. Lastly, you can find ways to increase your income – either at your day job or a side hustle. I prefer the latter, but either will work for your purposes. If you prefer the side hustle route, here’s a list of 50+ ways to make extra money to get you started. Regardless of the approach you take, set a goal of how much money you want to start with. I suggest a goal of $250. Open a high-yield savings account, put your money there and once you hit the goal, you can open a brokerage account. Heck, you can even start investing for as little as $5, if you open a Stash Invest account – and they give you $5 to start when you sign up through our link, so you can literally invest with nothing. There are more options than ever before to invest on a low income, which provides a great opportunity for those who must invest with a small amount of money. Ally Invest – Ally Invest has no minimum balance requirement, and you can place trades for $4.95. Check out our Ally Invest review to see how they work. Betterment – Betterment has no minimum balance requirement and, being a robo-advisor, they manage your investments for you. Check out our Betterment review to see how they work. E*Trade – You can open a retirement account for $0 and place trades for $6.95. Check out our E*Trade review to see how they work. Stash Invest – Stash Invest lets you start investing with as little as $5. You can invest in small amounts with Stash – either in ETFs or a selection of individual stocks. Wealthsimple – Wealthsimple has no minimum balance requirement, and like Betterment is a robo-advisor, so they manage your investments for you. Check out our Wealthsimple review to see how they work. The above are just a few of the options to invest on a small budget. You just need to find the one that works for you and start investing. Don’t be afraid to use the free tools they have available to help you start. Investing in the stock market isn’t complicated, it’s quite simple when done right. 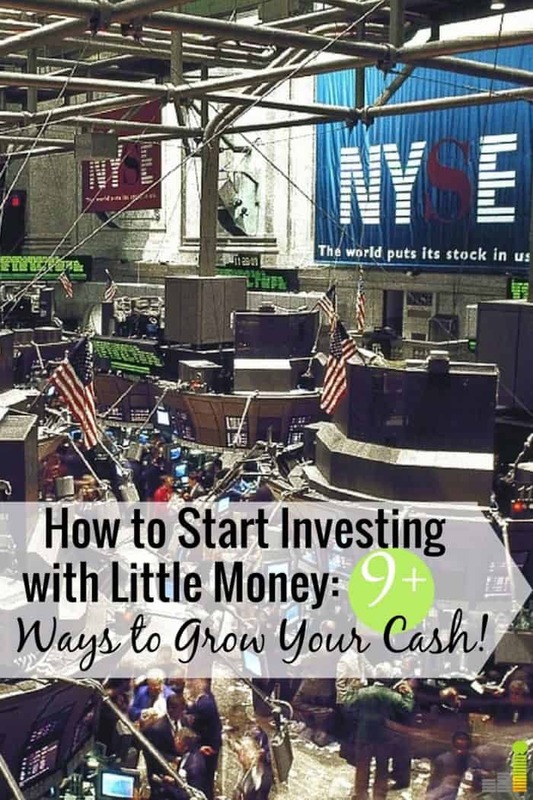 If you’re new to investing, check out our guide on how to start investing in the stock market. The above options aside, the absolute best option to invest on a low income is a 401(k). I’ve discussed 401(k) plans at length here on the site for one main reason – they’re so simple to set up. That’s also not to mention the free money aspect if your employer offers a 401(k) match. I’ve heard the argument of why you shouldn’t invest in your 401(k). It goes something like this: you feel strapped for cash and believe you can’t afford to invest. In reality, you can’t afford not to invest. Setting up your 401(k) may feel overwhelming. However, once you do set it up everything is automated for you so you can set it and forget it. The free money is icing on the cake, which makes the case for taking advantage of your 401(k) even stronger. Just remember to take the 401(k) with you if you change jobs! There are many excuses I’ve heard not to invest on a small budget. Some of the common ones are that investing is too difficult; that you can get to it “later;” that the money won’t make a difference; or that you need money for other things. I used all of those excuses myself, and that’s exactly what they are in most cases – excuses. Some may legitimately not be able to afford to invest, but for many, that is not the case. The biggest hurdle many face is simply feeling like they can invest. Investing in the stock market can be difficult, but by and large, it really isn’t if you follow a simplistic approach. I follow a very simple investing approach because investing really shouldn’t be difficult. If it is difficult, then it’s highly likely you don’t know what you’re doing and are opening yourself up to unnecessary risk. There are many resources available to help you get a basic understanding of investing, which is all you really need. Your 401(k) plan likely has free tools to help you. There are investing books for beginners that can help you gain an even better understanding, and many online brokerages offer free courses or tools to help you start investing. In fact, you have to purposely not look to avoid helpful resources on starting to invest. At the end of the day, a simple, automated approach is the best way to start investing on a low income. The rest will take care of itself with time and very little effort required on your part. What are some other ways to invest on a low income? How simple do you think it is to invest on a small salary? When did you start investing?